If you haven’t had a chance to experience Bradford Heap’s much buzzed about fare at Colterra or SALT Bistro, you should move that experience to the top of your Boulder must-do list. For those of you that have, this Thursday’s event at Bookcliff Vineyards offers a unique opportunity to explore a custom designed five-course menu of Bradford’s creations at a uniquely intimate venue alongside perfectly paired wines produced locally, right here in Colorado. 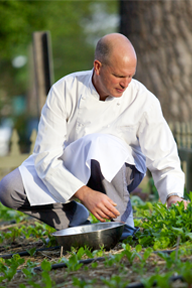 Chef Heap is well known for his commitment to providing fresh, locally-sourced non-GMO ingredients and prides himself on finding the intrinsic essence in his main ingredients and expressing those flavors, much to his diner’s delight. The owners of Bookcliff Vineyards, John and Ulla, have been supporting local chef dinners for many years, challenging each chef to come up with a menu that perfectly highlights Bookcliff’s award winning wines. This is the latest event in their monthly series. Thanks to their passion for wine, Bookcliff Vineyards has become a premier Colorado winery, winning 17 gold and double medals, including best of shows.